The listings on this page include references to print publications as well as links to online articles and videos featuring programs organized by Castine Arts Association. Online publicity of the 2018 festival by Plein Air Magazine. Our third festival is a big success! Castine Arts Association sponsors a three day plein air festival with 40 artists. The Castine Arts Association announces a three day festival in 2014. Click the title above to read the article in the March edition of Compass. 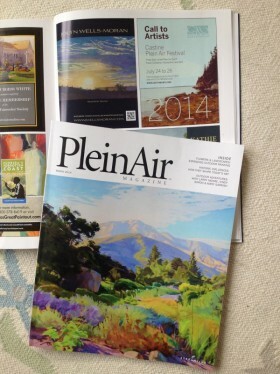 See our Call To Artists ad for this year&apos;s Castine Plein Air Festival in the Feb/Mar issue of Plein Air Magazine. Christmas Celebration at the Unitarian church held December 10, 2013. Photos from the 2013 Castine Plein Air Festival.